Visualize a globe in which you can just walk up and use anything – you command and the things are the done!!! This is the idea for Google’s Physical Web, a mission to modernize the earth, where all physical objects can be connected and communicated with each other in the digital world. BLE beacons with the use of Eddystone provide better location and proximity experience to your users by giving a robust context signal. The Eddystone platform enables you to manage the BLE beacons remotely. It can be integrated with various Google services and discover content and functionality across Android, native apps and the web through users’ devices. Let’s see how it will revolutionize mobile experience and the IoT. Eddystone-UID (Universal Unique Identifier): This frame broadcasts unique ID number and is used to triggers relevant information and provides proximity-aware user experiences to prompt user to take action. A mobile app can display data stored locally or dynamically fetch data from server. It is 16 bytes long and is divided into two parts: 10 bytes for namespace and 6 bytes for instance. Eddystone-URL: This frame broadcast the compressed 17 byte URL whose information can fit into a beacon signal and can be used by application to link to about location specific content. With such facility, users can refrain from downloading the app as the store can send URL on the user’s phone and they can look-up for offers and deals on a web browser. Small business owners can be benefited with this service. Eddystone – TLM (telemetry): This frame broadcasts the signals that contain information about the beacon device, battery level, device temperature etc. It is sync with API of proximity beacon and hence can be helpful for the developers to track the health of battery. It is intended for beacon owners for fleet management and must be paired with Eddystone-UID and/or Eddystone-URL. Since Eddystone is robust, supports comprehensive beacon format, libraries and applications can be implemented on both the operating systems i.e. Android and iOS; that are capable of using Bluetooth low energy. Additionally, you can make the use of Nearby API to develop solutions based on the other formats (For example SDKs from Estimote and Kontakt.io). 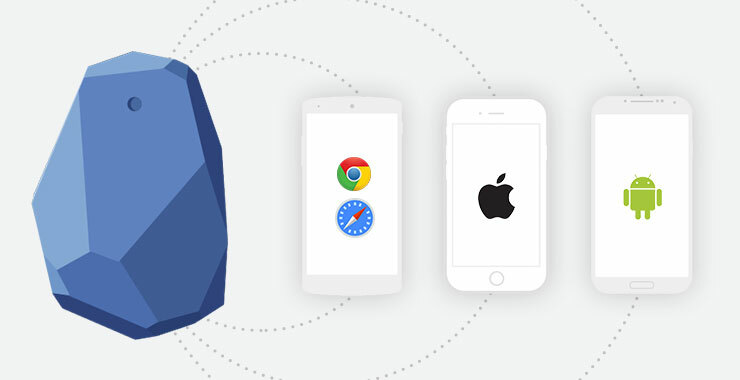 As Google also announced the support of Eddystone and Physical web in mobile chrome browser, you can discover more about Eddystone beacon in an easy way. Physical web support is the backbone of Eddystone as it discovers URLs based on the nearby locations. It addresses the questions that people look for generally; For instance: Which is the best eatery place around me? This however solves the problem of precise location search. Hence the places like local restaurants, airports, hotels, bus stops, theaters, vending machines, coffee shops, schools, museums, and parks can be “proximity aware” without having a native app. This can be a game changer for any business as it serves a new way of promoting your brand via mobile web. Most of the small businesses lack in budget and audience to develop the app for their brand- but the physical web gives the businesses a new tool to promote their websites. TLM broadcasts transforms beacon into smart sensors and enable to transmit the sensor-driven data such as battery level, temperature, humidity in your surrounding environment and much more. For instance: if a smart beacon is deployed in bus, station, train etc – with Telemetry, you can have the ability to personalize the user-experience based on the weather, time, movement etc. A café can send push notification inviting people to have a cold drink or hot coffee depending on the weather. This essentially transforms the way in which users will interact with IoT-enabled device. Thus, given the many benefits that Eddystone beacons render, companies, be it big or small, should prefer investing in the technology. If you want to revolutionize the way your customer shop and engagement with them; get in touch with us – we will be happy to serve you and help you to get started.